Join the discussion on our forums! 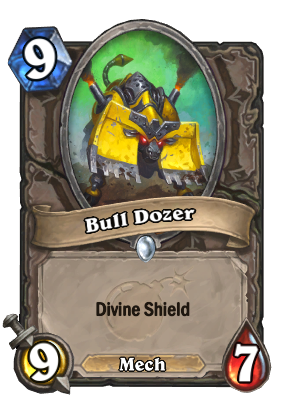 Come discuss Bull Dozer over in our dedicated Bull Dozer discussion topic. I thought bulls had rush, if only.. This kinda help when you summon random 9-drop which currently has a lot of bad stat minion. Very good Arena card with a pun to boot! For a pack filler, at least it's got one thing going for it: That card art. Good with Dr. Boom, Mad Genius. It will enter the field hitting something really hard without taking any damage in the process. It's probably better to pick this from Omega Assembly though. Probably just pack filler, stuff you'll eventually see out of Spiteful Summoner or Evolve or something, and appreciate it without ever intentionally using the card. Great to know! Thank you so much for informing! Funniest pun of the set! Arena-card, and quite a decent one! The jokes are strong in Team 5 with this one. The only way I see this being run is if Skaterbot becomes popular, and even then, it's a maybe. Pack filler, just because 9 mana. I guess you could argue for bringing it's cost down to 7 with Galvanizer (though it's still quite expensive) and reviving it with Kangor's Endless Army, but I can't see this being played in constructed. Arena will probably be a different story, as it tends to be.